Sometimes my job is very easy. I get to go see theatre and tell you all the great productions to go see. Right now it’s my pleasure to tell you that if you want to properly invest your time and resources, you will want to check out David Mamet’s American Buffalo, the latest production for Quill Theatre being held at TheatreLAB’s basement theatre (300 E. Broad Street, Richmond, VA 23219). The play, which premiered in 1975 before transferring to Broadway in ’77, has been the recipient of many awards and is often cited as one of the best plays of the 1970’s. It’s depiction of three lower class men planning a robbery in a Chicago junkshop is one of those great stories of pain and evil planning coming back to haunt those who plan the evil. From the moment you enter The Basement, you are in Don’s Resale Shop – essentially a junk store. There are lampshades and tennis rackets hanging from the ceiling and boxes and baby carriages filled with the detritus of life. Walls are festooned with framed pictures. Vinny Gonzalez’ set design is brilliant, claustrophobic, and completely immerses you into the world of the play. There is no separation of play and audience – we are so close to the action we can see every small facial movement of the actors and could tell if there was ever a false moment. What acting we were treated to. Or should I say no acting? It seemed so natural it felt like we were watching a documentary – the reality of lower class criminals practicing their dark and sullen craft. First off there’s Donny Dubrow who runs the shop and is as close to being the “brains” of the operation as possible. Donnie is played by Alan Sader, one of the best known actors in the Richmond area. Sader has essayed the role of both King Lear and Big Daddy and has transformed himself for the role of Donny. I don’t think he’s ever turned in a better performance than he has here. He stalks his kingdom menacingly and rules with an iron fist in a velvet glove. Jeffrey Schmidt is Teach, a loud mouthed, foul mouthed, dreamer of inflated proportions. He is a not-so-controlled explosion who never seems to run out of fuel. He talks himself into the planned robbery and is suspicious of all of the people that Donny has chosen for the caper. His confrontations with Donny drive the play and bring the fireworks that make the play so compelling. Bobby, the gofer for the shop, is played by Jesse Mattes. Bobby is a slow-witted junky looking for a father figure and a place to belong. Mattes seems like he has locked into a complete different reality in order to bring Bobby to life. The ensemble works brilliantly. The conversational interplay underlies the rage that lies underneath the surface. In a speech Mamet gave in the late 1980’s he summed up a convention in his plays that “sometimes conversation is disguised violence.” In American Buffalo the conversation leads to further violence – and since it takes place in such an intimate setting, appears to be magnified and even more dangerous. I’ve already mentioned Gonzalez’ amazing set. Buffalo has plenty of other technical aspects that are worth mentioning. Anna Bialkowski’s costumes are very strong. She has frumped up Sader in muted colors and a sleeveless sweater vest, and young Bobby has his Cubs shirt, but Teach is resplendent in a faux leather leisure jacket and sideburns so sharp they threaten to stab people in the second row. Michael Jarrett’s lights are nicely gloomy. Special mention should be given to Kelsey Cordrey’s sound and Mark Caudle’s fight choreography. Daniel Moore’s direction is sharp and crisp, not only moving his actors around the set, but allowing them the freedom to discover the depth of these characters and supporting their choices to create a dark and disquieting world. It is not easy to create such trust among actors and his efforts should be recognized for providing that support. 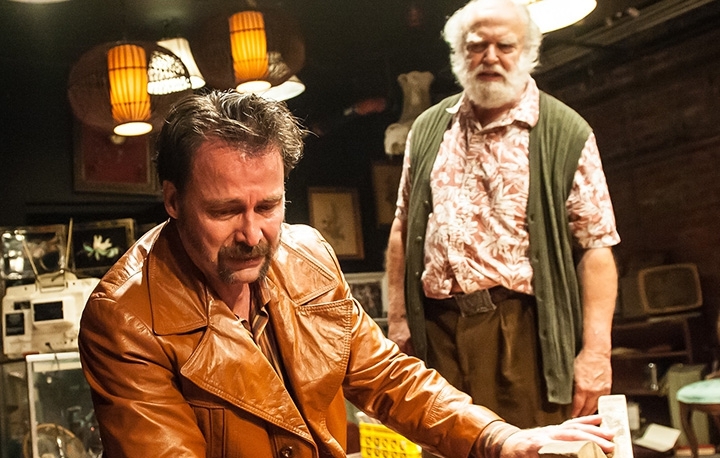 Simply put, American Buffalo is a rare achievement and easily one of the best productions I have seen in a long time. It may be tricky to find – The Basement is located down a flight of stairs at Third and Broad Streets, but it is so worth the trip. This is a definite must see.